OIM is an ideal tool for characterizing and investigating the effects of thermo-mechanical processing on polycrystalline materials. Keyword analysis of recent publications indicates that recrystallization, grain growth, and phase transformations are of strong interest to the EBSD community. One approach for investigating these phenomena is to dynamically characterize microstructural development using an in-situ heating stage combined with OIM measurements. For me personally, in-situ heating stage work has been a fun, challenging, and rewarding application. My initial introduction to this was using a heating stage to investigate the recrystallization and grain growth of copper damascene structures used in microelectronic integrated circuits (Field and Nowell, 4th International Conference on Recrystallization and Related Phenomena, 1999). This early work was done with an analog SIT camera, where we were lucky if we could collect 4 points per second. For comparison, the Hikari XP camera can collect up to 1000 points per second. Obviously, this faster collection capability allows for better temporal resolution of dynamic events. In addition to faster cameras, a number of software features have been implemented to make in-situ work easier, including a remote API to set up and capture multiple OIM scans, a batch processor to analyze multiple datasets easily and consistently, and an alignment tool to correct for small spatial shifts in data due to physical and thermal drift effects. There are a couple of different approaches I’ve used with an in-situ heating stage. The first is to heat the sample to a given temperature, and hold it there while multiple OIM scans are collected to capture the dynamic microstructural evolution. The first data series was collected from an OFHC copper sample that had been Equal Channel Angular Processed (ECAP) to introduce significant strain and produce a small grain size. It is this internal plastic strain that provides the driving force for recrystallization, which is the formation of new strain-free grains. The sample was held at ≈165°C and OIM scans were collected from a ≈30µm x 30µm region with a 200 nm step size at a rate of 1 scan per minute once the target temperature was reached. The following movie shows the combined Image Quality and IPF Orientation maps collected at each scan. You can easily see the nucleation and growth of the recrystallized grains from within the initially deformed matrix. 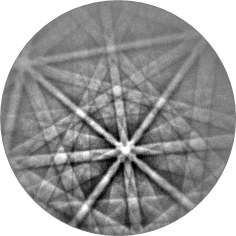 Significant twinning is also observed within the recrystallized grains. 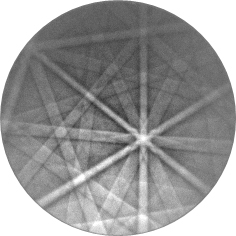 The Local Orientation Spread (LOS) measurement can be used to identify and differentiate deformed and recrystallized regions. In this next movie, the combined Image Quality and LOS are shown, with the LOS colored on a thermal scale where blue indicates recrystallized, lower plastic strain regions, and warmed colors indicate the presence of plastic deformation. The movies of course are very fun to watch and show, but it is important to note that each scan representing a section of time during the dynamic experiment is available for comprehensive analysis. Additionally it is easy within OIM Analysis to compare different time sections, which can allow correlation of recrystallization nucleation with the initial deformation microstructure or measurement of grain boundary migration rates. A few features of interest are apparent. First, there is a significant amount of twinning present in the austenitic phase structure. Second, the initial and final ferrite phase structures a very different, indicating that this is not a fully reversible transformation. Obviously there is a wealth of information contained within these related datasets, and full analysis and interpretation could be used to drive a number of publications. For this blog however, I just wanted to convey a sense of analytical possibilities that using an in-situ heating stage brings to EBSD. Finally, I’d like to thank Seiichi Suzuki from TSL Solutions for both designing and building wonderful heating stages for EBSD work and sharing the low carbon steel data as well as David Field from Washington State University for introducing me to and encouraging me with in-situ measurements.